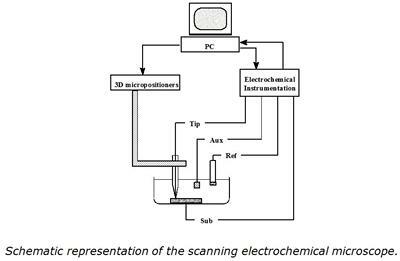 The scanning electrochemical microscope consists of a microelectrode held precisely in three dimensions by means of a micro-positioner. In the most common mode of operation, the current flowing to the microelectrode is recorded while scanning a few micrometers away from the surface under study. The instrument is akin to a high-resolution electrochemical radar where a species electrochemically generated at the probe tip diffuses towards the substrate and interacts with its surface. The tip current reflects the chemical properties of the surface and it is possible to image the reactivity of surfaces down to the micrometre scale. Although the best spatial resolution reported is around 20 nm, we aim to investigate electrochemical processes on the micrometre scale. The SECM is generally applied to the characterisation and modification of solid-liquid, liquid-liquid and liquid-gas interfaces. Our studies included probing proton ingress and egress from conducting polymer films, studying the relationship between ionic and electronic charge transfer in conducting polymers, probing ion fluxes through porous and semi-permeable membranes, studying pH variations at solid-liquid interfaces, mapping the activity of adsorbed enzyme monolayers, studying localised corrosion and probing the dissolution of enamel surfaces. In recent years we have focused on the development of nanostructured SECM tips, on the application of the potentiometric mode and on the development of theoretical expressions to predict the response of tips with a range of geometries, e.g. conical AFM-SECM tips. 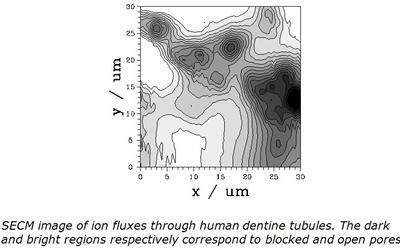 From Nugues and Denuault, Scanning Electrochemical Microscopy: Amperometric probing of diffusional ion fluxes through porous membranes and human dentine, J. Electroanal. Chem., 408, 1996, 125-140. From: Evans, Mesoporous Platinum Microdisc Electrodes and the Detection of Hydrogen Peroxide in Analytical Chemistry and Scanning Electrochemical Microscopy, PhD thesis, University of Southampton, Southampton, 2002. 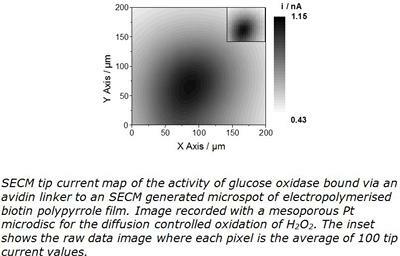 Evans, et al., Scanning electrochemical microscopy (SECM): localized glucose oxidase immobilization via the direct electrochemical microspotting of polypyrrole-biotin films. Electrochem. Com., 7, 2005, 135-140. Leonhardt et al., Atomic Force Microscopy-Scanning Electrochemical Microscopy: Influence of Tip Geometry and Insulation Defects on Diffusion Controlled Currents at Conical Electrodes. Analytical Chemistry, 2011. 83(8): p. 2971-2977. Avdic et al., Fabrication of cone-shaped boron doped diamond and gold nanoelectrodes for AFM–SECM. Nanotechnology, 2011. 22(14): p. 145306-145311. Serrapede et al., Scanning Electrochemical Microscopy: Using the Potentiometric Mode of SECM To Study the Mixed Potential Arising from Two Independent Redox Processes. Analytical Chemistry, 2013. 85(17): p. 8341-8346.